Thinking about planning a trip to the famous port houses of Portugal? If you enjoy drinking port, or just want to learn more about the fascinating history of Port and how it’s been made, stored and transported through the years in Portugal, you absolutely must get started planning your trip. We’ve got a fantastic list below of the 10 best port houses to visit while you’re in the Porto region. There are actually two sides to the city often referred to as Porto. On the southern side of the Douro river is the city of Vila Nova de Gaia and on the northern side is the Ribiera district and the city of Porto. 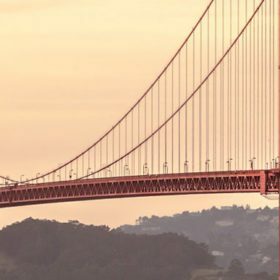 They are connected by the famed Ponte Luis I Bridge. The Vila Nova de Gaia side is where you’ll find all of the port houses. Along the river is the main road on which many of the port houses have tasting rooms, like Calem and Kopke. Some of the other houses are built up in the hillside and require a little climb to get there (like Offley and Graham). 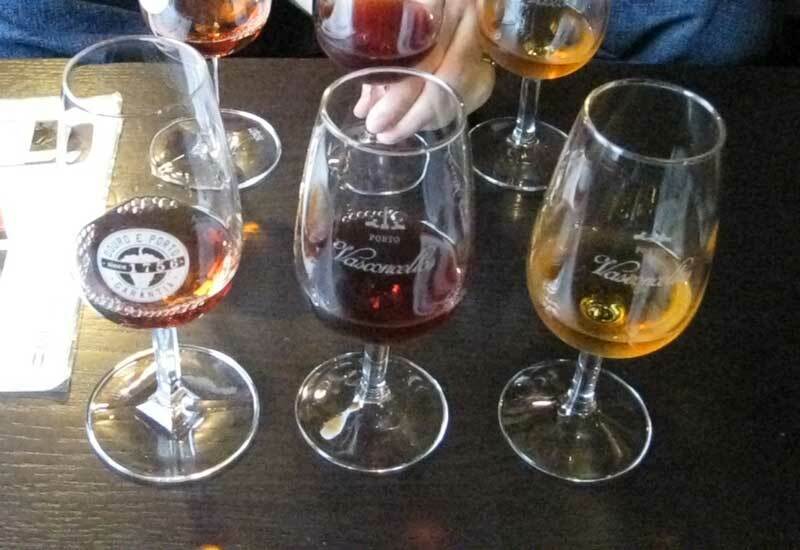 There are two ways you can do port tasting in Vila Nova de Gaia. The preferred way is to make an advanced arrangement for a tour and tasting. Not all Port houses have continuous tours that you can just pop into, and English tours are only given occasionally. Making a reservation will ensure you can see and do what you want, without disappointment. In order to make reservations, contact the port houses individually via email, or see if they have an appointment form on their website (many do!). The other way to do port tastings is to just pop into the tasting room and ask. While some don’t offer this, some do. We also found that we could walk in and schedule an appointment for later the same day. If you don’t want to go through a tour at each port house, it would be wise to find out which places offer just a simple tasting. You can do that by emailing in advance. ⇒ Check here for great Port tours in Vila Nova de Gaia. If you’re looking for a longer tour that includes a visit to the Douro Valley, try this 3-day excursion. While you’re doing your research on visiting Porto, you might also want to know the top things to do in Porto and where to eat and drink in Porto. If you’re looking into a trip to Porto for Port wine tasting, and you want to find the best port in Porto, you’ll quickly find that there are dozens of Port Houses to visit, so the decisions aren’t going to be so easy. This guide will help you narrow down the choices. These are 10 favorites we discovered among the Port houses that dominate the landscape in Vila Nova de Gaia. If you’re a power taster, you can probably get around 4+ port houses in a day, if planned properly. But we would not recommend this feat if you don’t do a lot of wine tasting or drinking normally. Don’t forget that port has a much higher alcohol level than wine and can catch up with you quickly. We recommend only visiting 2-3 port houses in a day. Don’t forget that Porto is only an hour’s drive from the beautiful Douro Valley wine area, where the views will absolutely stun you. We have a couple of bottles of Cálem 2011 Vintage aging at home, so this was our first stop. It’s also the first Port House along the Cais de Gaia (the main road that runs through the lower waterfront area of Vila Nova de Gaia). 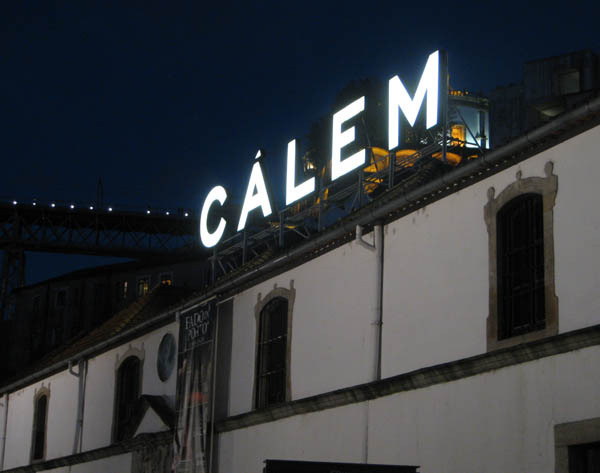 Calem is one of the top Port cellars in town, and certainly one of the largest. They offer three options for visitors to enjoy. A typical tasting and tour (€10) includes an interactive museum, a guided tour of the cellar and a tasting of three Ports: a ruby, a tawny and a white. 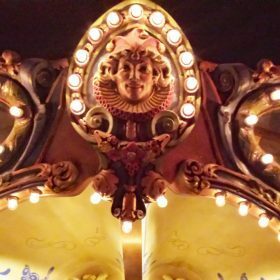 There are then options to add a Fado show or to add a food tasting to go along with your wine (chocolate, cheese & chocolate, or food pairings). The tours operate regularly throughout the day in various languages and last about 45 minutes. The Fado show is only offered at 6pm. There is an English tour that culminates in a tasting room where you’ll enjoy a 30-minute performance of traditional Fado music. The current cost is €21. You can book your tour and pay for your tickets directly through their online form. Kopke is the next tasting room you’ll come upon along the Cais de Gaia. It is the oldest port wine house, originally opened in the 1600s. 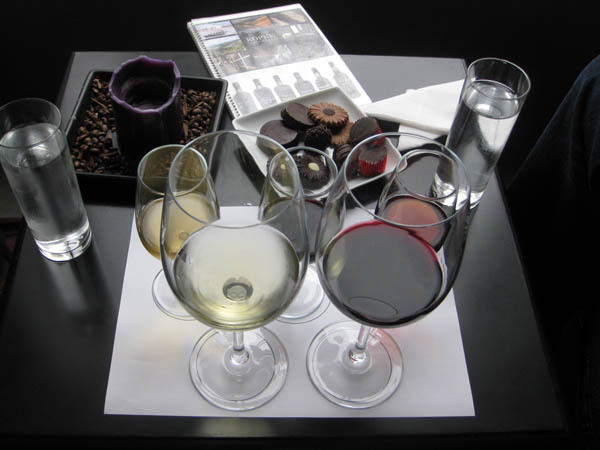 They don’t offer a tour, but they have a menu full of choices for tasting, including some really nice wine flights that are paired with chocolates. The flights include other wines made by Kopke, in addition to Port. You’ll choose your tastings downstairs and then find a seat upstairs in the lounge. Kopke is very famous for their Vintage and aged Tawny Ports. 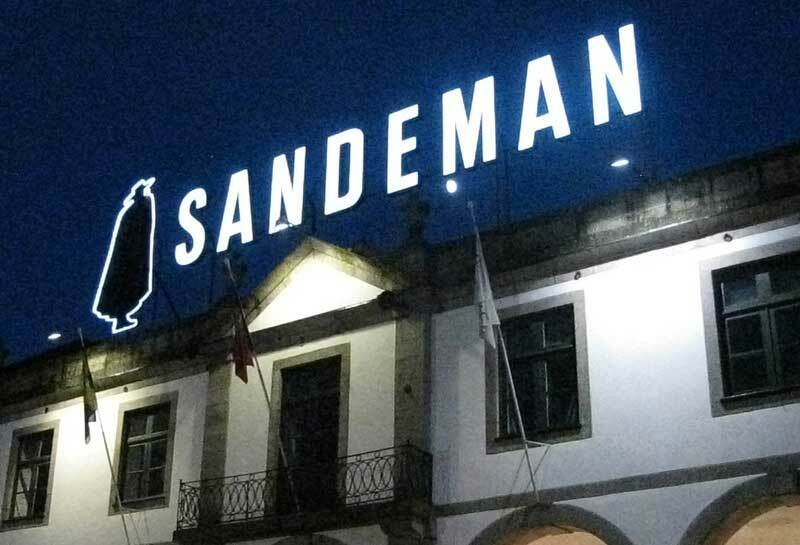 It’s hard to miss the large building that houses Sandeman. The cloaked man is hard to ignore as you pass by. While you don’t need to make a reservation to tour the facility, you do need to be aware of when the tours take place in English (or your preferred language) so you don’t miss it. When we were there, the English tour was given at 2pm. This is a large facility and its often packed with visitors, so arrive early. 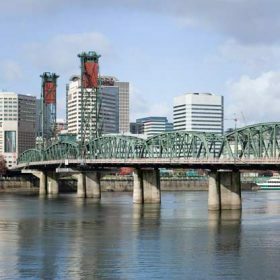 They offer a Classic tour that includes a tasting of Ruby and Tawny Ports, and their 1790 Tour that includes a more in depth look at the facilities and a tasting of 5 unique Ports. Along the waterfront, you’ll find a couple of small tasting rooms for Port Houses that have their main production and aging facilities in the Duoro Valley. Quinta do Noval is one of them. It’s just a wine shop and tasting room with a couple of tables to sit at. But it’s not to be overlooked! This is a great choice when you’ve heard the same tour over and over and want to try the port without the tour. 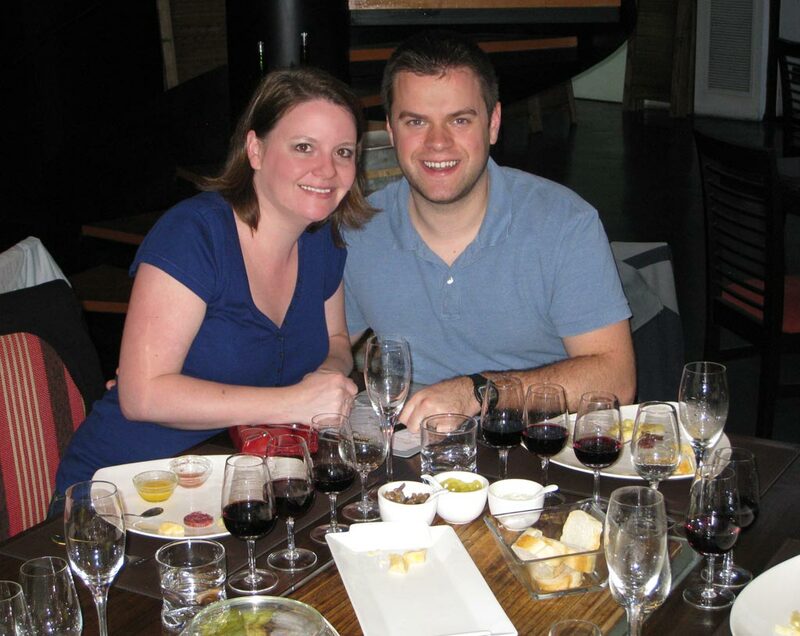 In the small tasting room, you can choose small tastings, or have a full glass, and even half or full bottles of Port. You may not have heard of the Vasconcellos port house before. 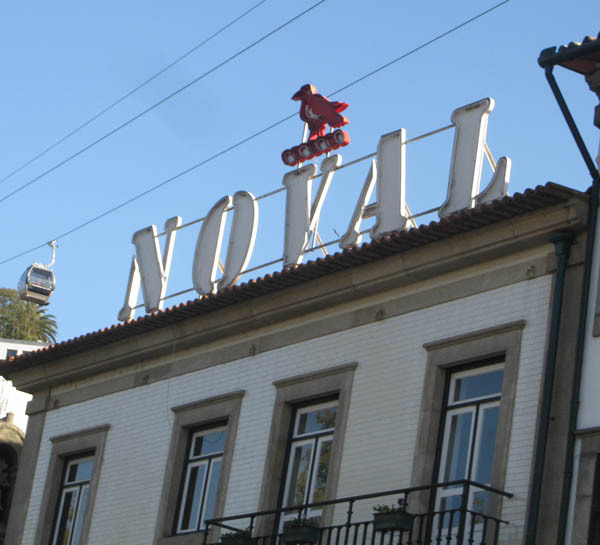 It’s not one of the enormous commercial brands that you see so much of in Vila Nova de Gaia. Here, you’ll be treated to a smaller, more intimate, tour than at the larger houses and you’ll learn quite a bit about the process they use for blending the more than century-old Ports they have aging in their cellar to create the 10, 20 and 40-year Ports they make. We were guided around by Jorge Silva, who took great pride in the port that he was telling us about. We had a very informative tour of the cellar and then made our way up to the tasting room to give it a try. The tasting included a 10 and 20-year Tawny and a white Port. If you are looking for a 40-year port, they have that too. We fell in love with their 20-year (the bottle and all) and had to take some back with us. We since returned to Vila Nova de Gaia and stopped in for some more. I highly recommend stopping at Vasconcellos for the tour and tasting, as it’s one of the few that doesn’t feel overly commercial and touristic. We also found it very easy to work into the schedule because tours are given upon request, so you don’t have to wait for a scheduled tour. If you can make an advanced booking, it’s definitely recommended, but you can just approach the cellar door and inquire about tastings in person. 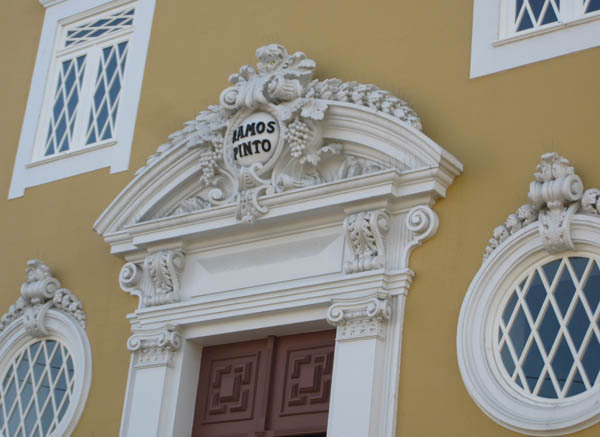 Housed in a beautiful yellow building founded by Adriano Ramos Pinto in 1880, Ramos Pinto stands out among the Port houses on the main street. A tour of the cellars also includes a visit through the cellar’s museum that houses a collection of art and items from the house’s long history. The tour ends with a tasting of two Port wines, a ruby and a tawny, which are presented in a large, yet comfortable lounge area with couches and barrels for tables. You can schedule a visit at the reception area just inside. They give regular tours in English. The last tour takes place an hour before closing. Hours: May – October: 10am – 6pm (open every day). November – March: Open Monday – Friday (except bank holidays) 9am – 5pm. April: Open Monday-Friday (except bank holidays 10am – 6pm). 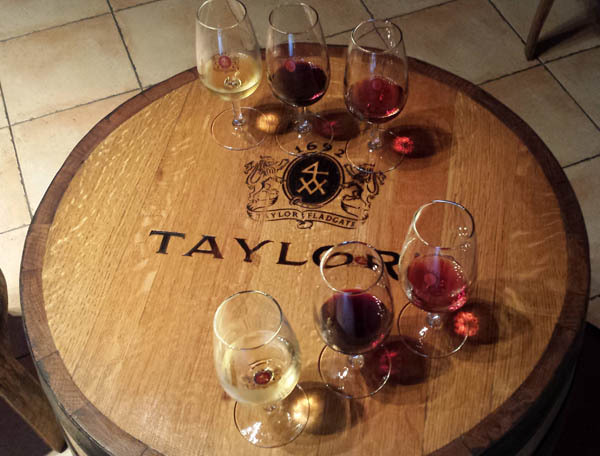 Taylor’s wine cellar is now in its fourth century of operation, which in itself is a major accomplishment. The story of Taylor’s is very interesting, and well worth learning about. The port house is located up a fairly steep hill, so be prepared for a bit of a hike. From Ramos Pinto, head up the alley and continue up the hill until you reach Taylor’s on the right. Tours at Taylor’s are mostly self-guided now, though you can book a private tour in advance if you want. There is no need to schedule a audio tour in advance. You can walk through and listen to the history and details of the Taylor family and winery at your own pace, in many languages, while looking at the displays and barrels throughout the cellar and museum, which have been recently renovated. It costs 12€. 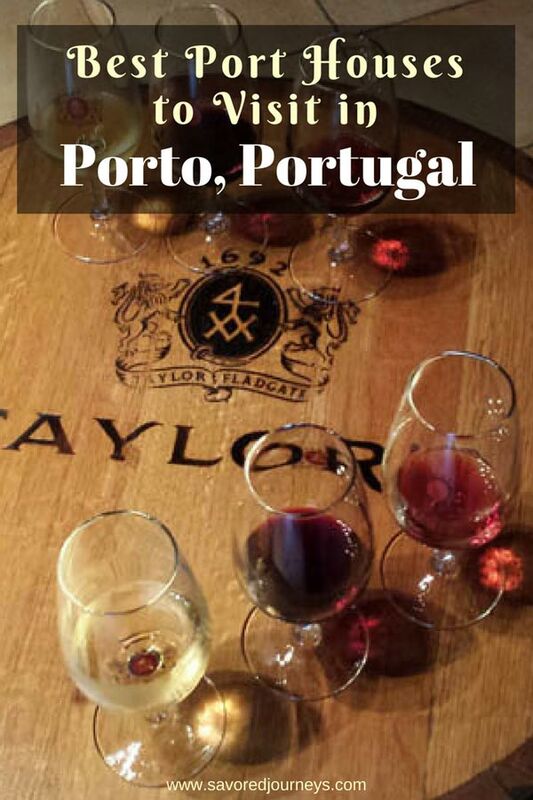 At the end of the tour you’ll have a tasting of two of Taylor’s ports: and Extra Dry White and Late Bottled Vintage (LBV). You’ll want to schedule for at least an hour or two to wander through the cellar and finish the tasting. The last tour takes place an hour before closing. Hours: Monday to Friday: 10am to 6pm, Saturday-Sunday: 10am to 5pm. Offley Forrester is also located up the hill near Taylor’s. It’s very convenient to visit both. Founded by William Offley in 1737 under the guidance of Joseph James Forrester, who was a prominent figure in Port history. If you’re lucky enough to visit during their open season (they’re closed from November to February), you’ll get a glimpse into one of the oldest and most influential Port houses in the city. Tours are given through the cellars where you’ll learn the story of Baron Forrester while perusing the barrels aging in the cellar. Tasting includes two Ports. There is a premium tasting offered, as well as a pairing with tapas, both which should be arranged in advance and cost more than the classic tasting. Cockburn is located slightly farther and also up the very steep hill. It’s about a 10-minute walk from Taylor’s, though at around the same elevation. If you’re taking the Hop-on-Hop-off bus tour around town, there is a convenient stop right outside Cockburn’s door. The tour takes you through the cellar and the stacks upon stacks of aging barrels. 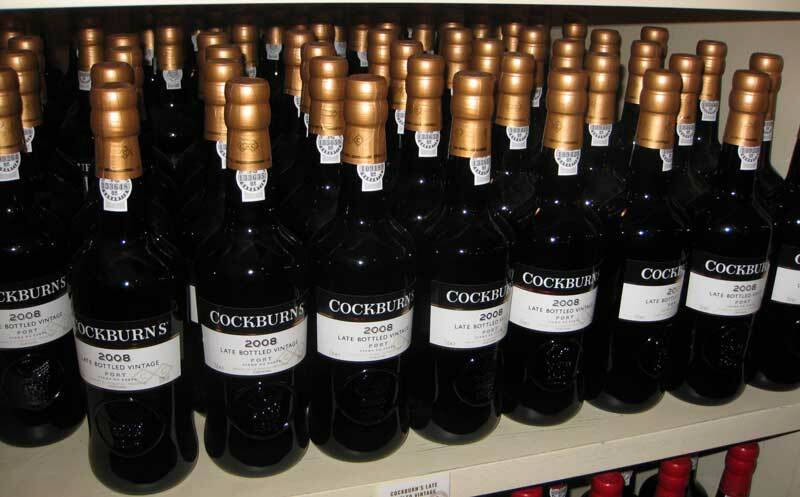 Once a family estate, Cockburn is now owned by the Symington Family that also owns other Port cellars, such as Graham’s and Dow’s. They specialize in median level wines that are approachable. The tasting includes a young ruby and a 10-year tawny. Graham’s Port House, opened in 1890, is located the furthest away from the others. It’s on the hillside, about a 15 minute walk from Taylor’s. You can enjoy lunch in Graham’s restaurant, Vinum, which helps make the trip there worthwhile, especially if you’re walking. Just remember that it’s a very steep hill. Another aspect that makes it worthwhile is the incredible view. A tour can be booked in advance online, which makes it easy to fit into your schedule without walking all the way there to find out their hours. 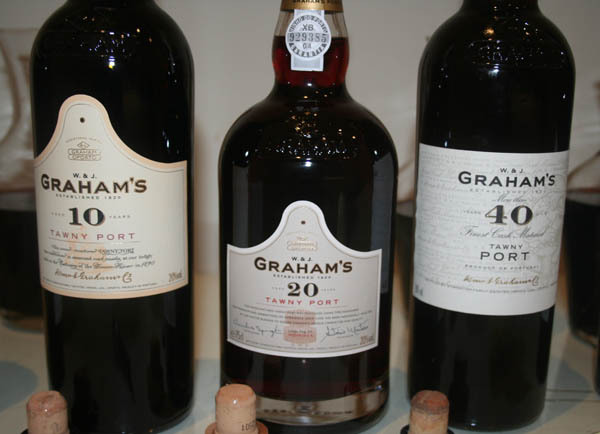 If you’d rather not take a tour, there’s a wine bar in Vinum where you can taste some of Graham’s Port by the glass. Website: Book your visit online. Hours: April to October, every day from 9:30 AM-6PM (last visit at 5:30PM). November – March: Open every day from 9:30 AM-5:30PM (last visit at 5:00PM). Closed December 25th, January 1st, and 2 days for staff training every year in February. With so many great choices, I know how hard it is to choose which port houses to visit in Porto, but you can’t go wrong with any of the 10 choices above. And of course there are dozens of others that I haven’t mentioned that are also worth visiting. I just caution you to be judicious and not go to too many. Since Port wine is fortified, it will catch up to you a lot quicker than regular table wine. Three of my favorite places to eat in Vila Nova de Gaia are all within easy walking distance of each other. If you’re staying in the city, you’ll be able to enjoy these and so many more without worrying about transportation. The Gastronomic Restaurant at The Yeatman is also highly recommended during your stay. The chef’s tasting menu with wine pairings is a great food experience. It is a bit pricey, but that’s to be expected at a 2-Michelin star restaurant. We also had a really good Francesinha sandwich at the bar in the hotel. Taylor’s Wine House is one of the few cellars that also has a restaurant where you can enjoy a leisurely wine lunch or dinner. In nice weather, the outdoor terrace has an amazing view of the Douro River. Wine Quay Bar is across the water on the Porto side, but it’s still very easy to get to. You won’t regret the choice because view will blow you away. Stop by there for a wine flight and some tapas. Across the street from Taylor’s Port House is The Yeatman. I highly recommend booking a room at The Yeatman during your stay in Vila Nova de Gaia. It’s very convenient for port tasting, and the views from the rooms and the restaurant terrace is unbeatable. They even have a wine decanter shaped pool. If you’d rather stay on the Porto side and either walk or take a bus over to Vila Nova de Gaia for port tasting, we highly recommend the Intercontinental Porto Palacio das Cardosas. ⇒ Read reviews on the Intercontinental on Trip Advisor or book a stay on Expedia. Porto and Vila Nova de Gaia are the perfect getaway for sweet wine lovers. You could probably spend weeks there and never run out of port houses and restaurants to try. 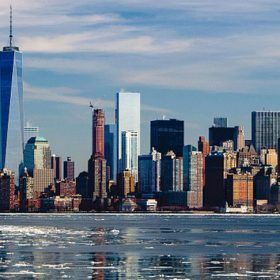 The city is very easy to walk around and extremely pleasant on a cool spring or autumn day when the crowds are fewer and it feels like you have the city all to yourself. You’re going to love it! This entry was posted in Wine and tagged portugal, wine. It’s made our trip a little easier and more enjoyable. 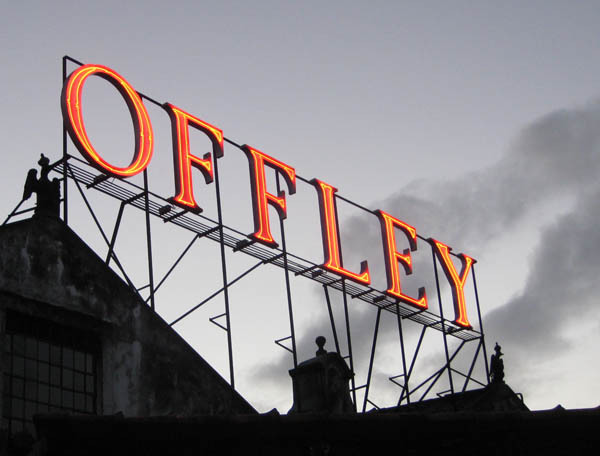 Offley is a great one! I just love how close together they all are and you can really just stop off wherever you like along the way. Glad you had a nice time there. Visited Offley in driving rain last year. We also took a train ride up the Douro valley, which was excellent . Going to Porto again next month. Very much looking forward to visiting several more port houses, as well as the Yeatman. That’s funny. We ran from Offley down the hill to Ramos Pinto in the driving rain. We were drenched by the time we got there. Hope you enjoy your next trip there. I can’t wait to go back. Glad to hear it, Rob! Enjoy your trip. What were the average prices for the tastings/tours? Do they vary greatly depending on which port house you go to? Hi Rachel. I would say currently the average price is around €10 (give or take). For instance, Calem is €10, Taylor’s is €12. Prices do vary. May of the port houses now offer the ability to book tickets online too, which is very useful. Laura- we are visiting Porto for one day in May on a cruise ship. I want to experience the port houses, do tastings within reason( meaning I will need to pace consumption so I remember the experience! ), and have a fabulous lunch. In your opinion do I need to hire a guide to maximize efficiency? Any suggestions appreciated. Have you also gone on tours in the Douro valley to visit where the port is actually made? Hi Paula, it’s super easy to do port tastings on your own along the main street in Villa Nova de Gaia. You can get there quickly from the cruise ship and then you can just walk around along the street and stop in where ever you want. I highly recommend Vasconcello. If there are any port houses that you absolutely want to visit, make sure you email them in advance and make an appointment. There’s no need at all to hire a guide.